Looking back through my catalog of images, I see that the last time that Annette and I were out shooting was the beginning of November. That’s three months of photographic inactivity! Wow! Last night we finally decided to shoot and it felt good. 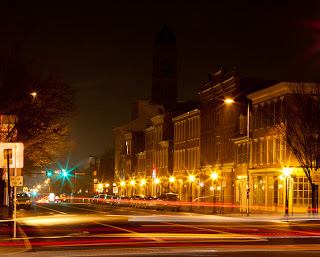 The Harrisburg Camera Club is trying a themed competition for the March event. The them is outside night photography. Fortunately, they set up a photo shoot to give an opportunity to get out with fellow shooters and get a night shot. The venue was downtown Carlisle. It makes an impact when 12 or so tripod toting people wander through the town pointing their cameras at everything in sight. Some guys asked some of the group who we were and what we were doing. He said we were the talk of the town! Here are a couple of the shots that I took. They are vastly different! Speaking of different, no wonder they say that two photographers shooting side by side will come up with very different shots of the same subject, when I go three very different shots and I am only one photographer. I had to wait a while to get this shot. I did not want any cars coming toward me. Their lights would have been way too bright! But I did want cars going away or crossing in front of me so that I could capture the streaks. The abstract pictures that I took last night were actually the most fun! I need to do more! I usually do not do photojournalistic type of stuff. But I liked the light fixture and the lettering is an indicator of the times. You know…It wasn’t that long ago that a person could smoke in any bar or restaurant. 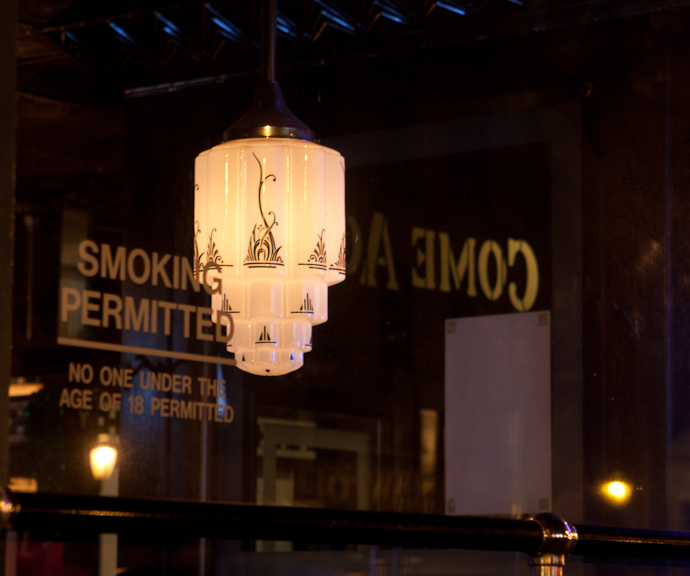 Restaurants had Smoking and Non-Smoking sections. Now it is a selling point that you can smoke in this bar.